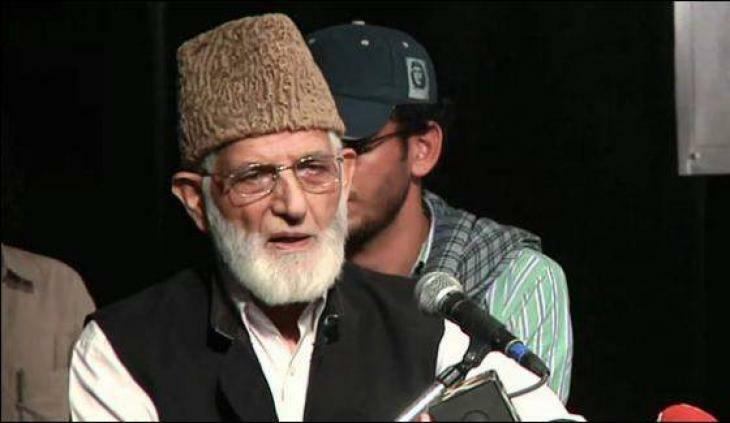 Srinagar, September 05 (KMS): In occupied Kashmir, the All Parties Hurriyat Conference Chairman, Syed Ali Gilani, has reiterated his appeal for complete boycott of the so-called upcoming Panchayat and Municipal elections to safeguard the right to self-determination movement of the Kashmiri people. Srinagar, September 05 (KMS): In occupied Kashmir, the Chairman of Hurriyat forum, Mirwaiz Umar Farooq, has expressed concern over the deteriorating situation in the territory, particularly in South Kashmir. Srinagar, September 05 (KMS): In occupied Kashmir, Indian troops in their fresh act of state terrorism martyred one Kashmiri youth in Rajouri district, today. The troops killed the youth during a military operation in Kass area of the district. The troops have handed over the body of the slain youth to local police. Further details are awaited. On the other hand, a non-local labourer was critically injured in firing during crackdown operation by the Indian troops in Hajidarpora village of Pulwama district, today. The labourer identified as Suresh Kumar of Uttar Pradesh was shifted to Soura Institute of Medical Sciences in Srinagar where he succumbed to his injuries. Srinagar, September 05 (KMS): In occupied Kashmir, the All Parties Hurriyat Conference Chairman, Syed Ali Gilani, while reiterating his appeal for complete boycott of the so-called Panchayat and Municipal elections, has said that the boycott of elections is the best option to safeguard the movement for right to self-determination. Srinagar, September 05 (KMS): In occupied Kashmir, senior APHC leader and the Chairman of Tehreek-e-Hurriyat (TeH) Jammu and Kashmir, Muhammad Ashraf Sehrai, has strongly condemned the arrest of prominent freedom leader, Syed Salahuddin’s another son, Syed Skaheel Ahmed Shah. Srinagar, September 05 (KMS): In occupied Kashmir, ahead of the so-called upcoming local bodies’ elections, the authorities have started a fresh crackdown on Hurriyat leaders, detaining several activists and leaders under draconian law, Public Safety Act (PSA). At least five Hurriyat activists were arrested over the past few days, while raids were conducted at a dozen places for more arrests. Srinagar, September 05 (KMS): In occupied Kashmir, one person was critically injured after Indian troops thrashed family members and neighbours of a freedom activist in Pulwama district. The residents of Dogripora in Awantipora area of the district told media that the troops entered the village at around 12:30 am and ransacked house of the Hizbul Mujahideen commander, Lateef Ahmed Dar, and thrashed his family members which included his three brothers namely Gulzar Ahmed Dar, Nadeem Ahmed Dar and Zubair Ahmed Dar. The locals said that later the troops also beaten up three neighbours of the Hizb Commander namely Muhammad Azhar-ud-Din, Bilal Ahmed Dar and Ishfaq Ahmed Lone. They said that Azhar-ud-Din suffered injuries and was admitted to a hospital. The residents demanded stern action against the troops involved in ransacking of the houses and beating of inmates. Srinagar, September 05 (KMS): In occupied Kashmir, the Chairman of Jammu and Kashmir Muslim Conference, Shabbir Ahmed Dar, and human rights activist, Muhammad Ahsan Untoo, visited Chew Kalan area of Pulwama and expressed solidarity with the family of martyred youth, Fayaz Ahmed Wani. Islamabad, September 05 (KMS): The All Parties Hurriyet Conference Azad Kashmir (APHC-AJK) chapter organized a condolence reference in Islamabad to pay homage to the deceased Hurriyet leaders, Dr Abdul Aala and Mushtaq Ahmed Wani. According to Kashmir Media Service, the condolence reference was chaired by the APHC-AJK Convener, Ghulam Muhammad Safi, while Jamaat-e-Islami AJK senior leader, Abdul Rasheed Turabi, was the chief guest. Srinagar, September 05 (KMS): In occupied Kashmir, a delegation of Jammu and Kashmir Muslim League visited the family members of martyred civilian, Fayaz Ahmed Wani, at Chew Kalan in Pulwama district and expressed solidarity with them.